Parenting is not easy. I don’t know what I am doing. The Angry Wolf of this job says, “I will not tolerate this behavior.” The Angry Wolf says, “My Way or the Highway.” The Angry Wolf lives in fear of ingratitude, threats to it’s authority, tarnishing of it’s image, mutiny, and failure. Once this is known – suffering becomes a memory. The threat disappears like smoke. I watch myself and see joy, ease, compassion, often, no matter the swirling whirlwind of the suffering that comes to those in my care from the confusion of growing up in our culture, in our family, with this Mother. The sticky times are observed as well and I can clearly see where I am attached to some idea that I believe I can be hurt or diminished in some way. Those incorrect thoughts bring out the Angry Wolf. The Peaceful Wolf knows that no one owes me anything, ever, no matter what I have given. Every act on my part is a gift and a service that I give, and nothing can be expected in return. With the commitments I have freely made, I will serve with pleasure, with no expectation of the reward of appreciation for MY service, no expectation of closeness derived from MY giving, no paybacks, no front of the line, no piggy back rides up the mountain – unless these gifts flow to me from the kindness of another, unexpectedly. In my observations of myself, I see that when I’m tired or engaging in incorrect thoughts, I can imagine I’m put upon. In this state of mind, no words even need to be spoken; this mindset is conveyed telepathically and bodily and throws me and others out of synch. Since I cannot be diminished, ever, all is always good. In the story, the Peaceful Wolf is fed, so it grows, while the Angry Wolf shrinks from not being fed. Perhaps the Angry Wolf is swaddled, loved, and absorbed. Who knows? I still don’t know what I’m doing. But this makes sense tonight. I hear you sister! When parenting gets really bad for me, I take my angry wolf for a car ride and let it howl. Big loves sent your way, S!! Traveling the stream together, we, and we are embraced and loved by the all, while we are down in it or up above. And we are reading Vonnegut in class…”SO IT GOES”! really!! Great post..parenting is hard bloody work! Tis! But the perfect key combination of unlocking, I’m seeing. Love love love seeing your dd today – such presence captured in those candid life moments. Rght at the end of a knot being brushed out, then the brush flows smoothly through silken hair. shanti (saying the word flows peace within, even) grateful, kai. The wolf knows the song of the Moon and the Stars. When the silence of the night comes and all are lost in slumber, the wolf has woken up from the dream of delusion. One life to the next just a revolution of time the anger subsides to the silence of the night. You have a great blog! Best of luck! Anyway, just know that your blog is great and worth many awards! I am enjoying reading your posts. So glad to have found your site. 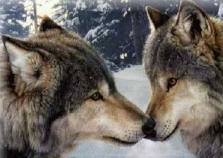 I love the story of the 2 wolves. I am struggling with how to share my story of healing with those who are still struggling..and to integrate for myself. Yes, maybe the angry wolf is swaddled, loved and absorbed. Love that. Yes, indeed! Not sure though how to reach back and share with those still struggling against it. I know I sound crazy to them and they can’t grasp the idea. I know I will figure out how to make the best use of my experience. For now, I keep writing. I looked up this story but I like your ending better. Maybe I can use this story. Would it be ok if I was to post this legend and use your ending..with credit of course? I think it could help some struggling little girls and women. Feel free to share however feels right to you, Laurie! Six or eight years ago, I was in this storm with my two older sons; in another 10 or 12 years, I’ll be back in this storm with my two youngest ones. It’s good to travel to bedlam and partway back, isn’t it? Thanks and peace. When I first heard of your life path Michael, I admit to a slight bit of sympathetic weariness, until I read your wonderful explorations of your world through the younger ones’ eyes – and I see your renewal in this new life. Just from the vantage point of teens, as you know, and the tall order of that, I can’t imagine the journey again – except as grandma 🙂 But oh the magic of little hands and boundless possibilities – and I see the same for you now, as you are in the incubator of your own renewal. Thank you for reflecting back to me from your own experiences. I know there are many years and tales full of learning and growth about which I find myself curious…I do remember clearly the last time I saw you with your oldest son in Greensboro. People stay frozen in that still frame of the mind. I think it Will be fun to explore through your words the how and why and what of your path!